Quiet place great pet friendly hotel. I will recommend for anyone who needs a affordable place. Property was close to interstate. Very convenient. Clean, helpful staff, breakfast. Where to find Morgantown hotels near an airport? Where can I find hotels in Morgantown that are near tourist attractions? If you're looking for comfortable lodgings in Morgantown, you'll find options aplenty! Expedia's comprehensive database contains 23 places to base yourself within a 0.1-kilometre (0.06-mile) distance of Morgantown's central area. Location is everything when it comes to stress-free traveling, so check out the The Chestnut Boutique Hotel and Waterfront Place Hotel, which you'll find a short distance of Morgantown's downtown area. 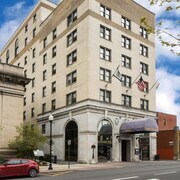 Star City has 2 Expedia-listed accommodations making it the part of Morgantown with the most hotels. It is 4 kilometres (2 miles) from downtown. Expedia-listed hotels in Star City include the Best Western Mountaineer Inn and Econo Lodge Coliseum. For a hotel situated in the area around the West Virginia University, you could investigate the Residence Inn by Marriott Morgantown or the Hampton Inn Morgantown. 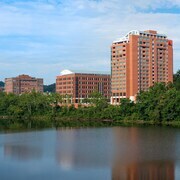 The Residence Inn by Marriott Morgantown is 2 kilometres (1 mile) away from the West Virginia University. 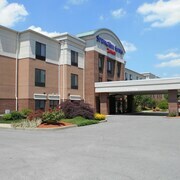 The Hampton Inn Morgantown is 2 kilometres (1 mile) away. If you have a limited budget and are simply after the more affordable Morgantown hotels or apartments, there are enough affordable hotels available in the area. 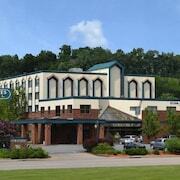 5 kilometres (3 miles) from Morgantown's downtown area is where you'll find the Quality Inn. The Suburban Extended Stay Hotel is only 2 kilometres (2 miles) away. 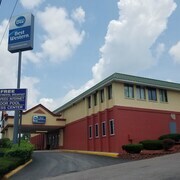 More options in the lower price range of Morgantown hotels are the Best Western Mountaineer Inn and the Ramada Morgantown Hotel and Conference Center. 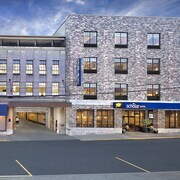 The Holiday Inn Express Morgantown is 5 kilometres (3 miles) from the center of Morgantown. Or, alternatively, the Holiday Inn Express and Suites Fairmont is located 30 kilometres (17 miles) away. The Springhill Suites by Marriott Morgantown and also the Clarion Inn are two other accommodation options worth checking out in Morgantown. Why don't you enjoy some more of the mountains that are common in Northern Panhandle? Choose to spend a few days in some of the other parts of Northern Panhandle. No matter if you enjoy popular local activities, such as mountain climbing, hiking and horse riding, or simply tour around to see the sights you will be able to reserve suitable hotel accommodation in the vicinity. Pleasant Valley can be found 4 kilometres (2 miles) to the northwest of Morgantown. While here, you can discover the Earl L. Core Arboretum. Star City offers some comfortable places to spend the night. You might like to also visit Pleasant Valley, the proud home of the Valley Worlds of Fun. Pleasant Valley can be found 25 kilometres (16 miles) to the southwest of Morgantown. 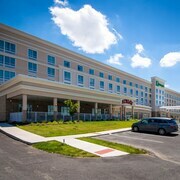 Hotel options in Pleasant Valley include the Fairfield Inn & Suites by Marriott Fairmont and Quality Inn. If you are flying into or out of Morgantown Municipal Airport and choose to stay nearby try Euro Suites Hotel or Clarion Hotel Morgan. What are the most popular Morgantown hotels? Are there hotels in other cities near Morgantown? What other types of accommodations are available in Morgantown? Explore Morgantown with Expedia.ca’s Travel Guides to find the best flights, cars, holiday packages and more!